Once again, drawing inspiration from the ALCAT 4-Day Rotation Meal Plan, I designed this 4 Bean Salad to suit me and my kids acceptable foods (for the time being). Our lists will be changing over time as we gradually re-introduce foods to our systems. I find it a very fun, creative and rewarding process to experiment with this food list. At first it seemed daunting – “how will I ever figure this out” to now realizing that I might have otherwise never considered combining a lot of these foods together. Food never tasted so good! The goal is to forever be able to eat a wide variety of wholesome foods but to never eat them too often, ideally keeping 36-48 hours in between each consumption. The finely diced cauliflower gives the bean salad the appearance of a goat or feta cheese, which is an interesting visual experience for me since I don’t eat any dairy anymore! Quantities to your liking…make a lot or a little. Combine following ingredients in a small glass jar with tight fitting lid. Shake well. Combine all 4 Beans, fennel and cauliflower ingredients together. Toss well. 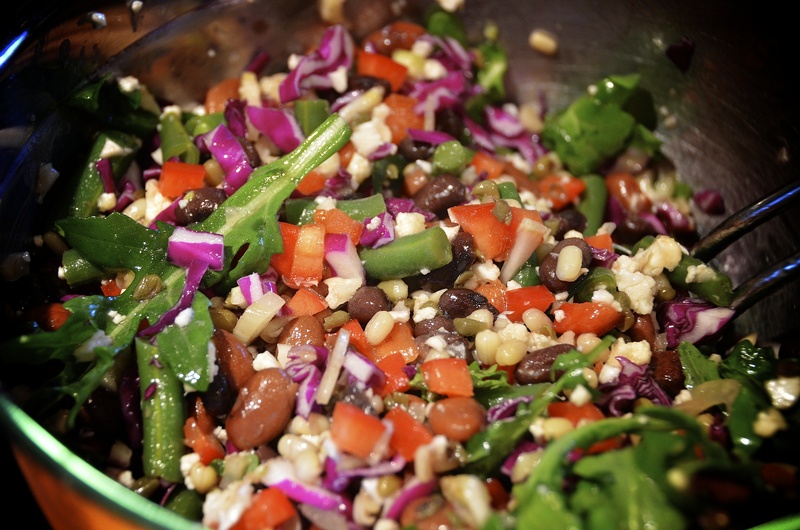 Pour dressing over bean salad. Toss well. Refrigerate for 3 hours or longer. Before serving, add baby arugula. Serve with cut up watermelon cubes on top, or leave in a side dish for topping. (Not everyone likes fruit in their salads).